With only a week to prepare and bake, I turned this little baby out for Dan and Bridget J. 's daughter Katheryn! 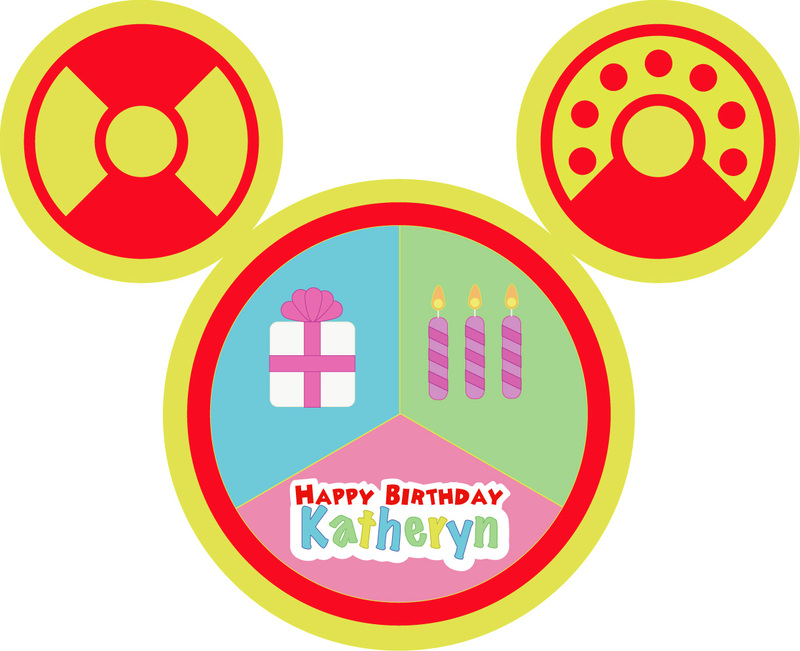 They're all big fans of the Mickey Mouse Clubhouse, and of course I couldn't resist! Here is the drawing, done in Adobe Illustrator (to scale!) 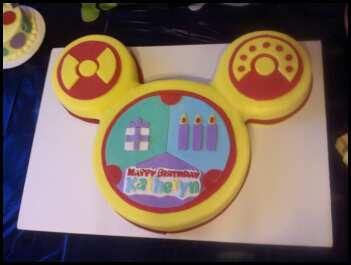 with a little help from Mike B.
I think the best part o this cake is the custom logo on the bottom, done in the same style as the Mickey Mouse Clubhouse. I did this by drawing it in Illustrator then printing it out. Then I laid it on top of the fondant and used pinpricks to trace it into the various colors and cut it out. The ending was this fabulous cake! 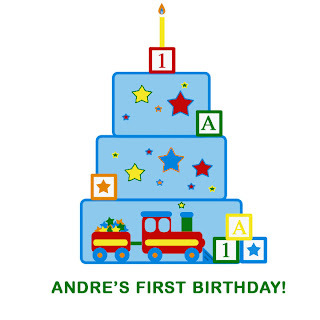 A good friend of mine, Art V., referred me to Michelle A., whose little boy is celebrating his first birthday next weekend! 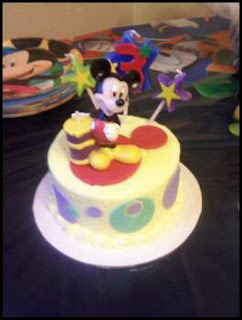 Here's the preliminary drawing for his cake, done in fondant, for 80 people! Pretty cute huh? I'm excited to make the blocks, I think I'll dry some fondant for the sides and make the inside out of either cake ball filling or sliced cake. Well, the block didn't turn out as planned. The fondant I was working with was a weird batch, so the blocks melted right on my tabletop! I opted instead to do flats of the blocks for ease of transport (the Mommy and Daddy will be transporting the cake themselves) and still keep the aesthetic. The rest of the cake turned out almost exactly like the drawing, which I am super excited for! Hope you guys like it! Spooky cake huh? This was a nice little 6" and 4" in grey marbled fondant and buttercream spiderwebs. 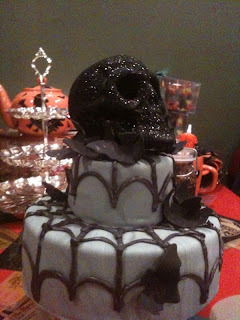 The skull was bought at the 99 Cent Store, but looked perfect atop this spooky cake! Well, turns out no one could give me the cymbidium blooms I needed, so I hit up my local crafts store and got some silk flowers that actually turned out rather nice (and they're food-safe!). Again, buttercream was a challenge in the heat and humidity of my kitchen, but all in all it turned out rather nicely and the client was really happy with it. Silly me though, I forgot my phone AND my camera during delivery! Fortunately, Stephanie W. was nice enough to snap a shot on her phone and send it to me. I also added some pearl accents to the sides simply because I couldn't resist. This was a hard one only because my directions were "clean lines" and "Hydreanga green and purple". It was neat to see how it differs slightly from my original mockup though! Turns out stencilling is something I can only do on fondant. Boo. 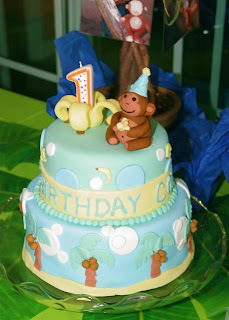 Here's a fun little cake I whipped up for Sean B., another friend of mine from work. 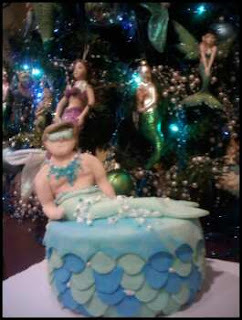 It's a little merman on top of a tiled fondant cake, complete with Mardi Gras mask and sugar pearls! Recently I made this little beauty (with some tiling help from Mike B. 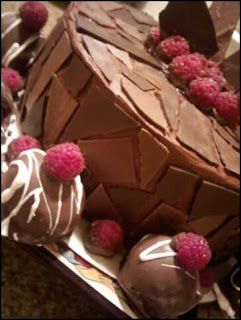 ), done in chocolate cake with raspberry buttercream, tiled in milk and dark chocolate tiles and surrounded by chocolate covered raspberries and chocolate raspberry cake balls. So pretty! Again, my dear artistic boyfriend Mike B. got himself into another art show (check out his blog here!). This one was rather informal, but I brought along some Om Noms, bakesale style! ... and here's my replica! Three tiers of om-nommy white cake goodness with buttercream filling. My first three-tier cake! 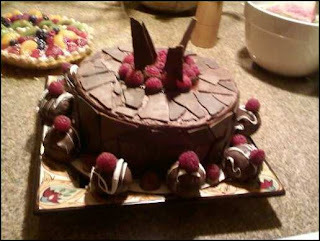 With all these cakes, I was bound to screw up sooner or later. That's when I discovered Cake Balls, FailCakes, and Balls of Broken Dreams. 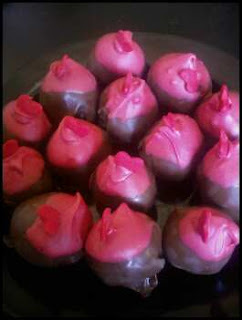 I take my cake shavings or broken tiers, add icing, roll them into balls, then roll them in chocolate. Here are some of the results! Patriotic Cake Balls! White cake with a cherry inside, covered in red white and blue chocolate and pop rocks! 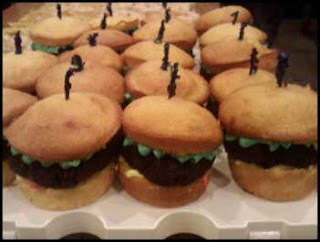 These aren't burgers, but cupcakes! Yellow cake for the buns, chocolate cake for the patty, and buttercream ketchup, mustard, and lettuce. This is the original FailCake. The challenge was to make something from your kitchen without going out to buy anything. I scraped together a cake and made some buttercream, but didn't have enough shortening to stiffen the icing! That combined with a rather hot day resulted in some of the cake melting down. Luckily, it still tasted good! 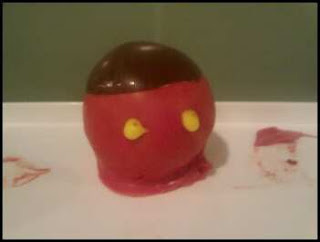 This was my first attempt at fondant sculpture. 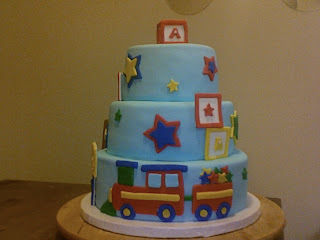 Little Conner N. needed a first birthday cake and a "smash cake" so he could have one all for himself! I based the design off of the invitation and did all of it in fondant. 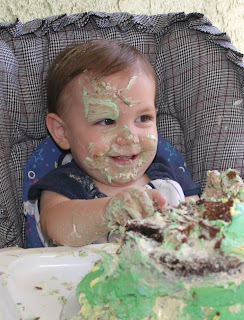 Conner had a "smash cake" all his own so he could play in the Noms! I made that guy out of buttercream for optimal smushiness. The big day! 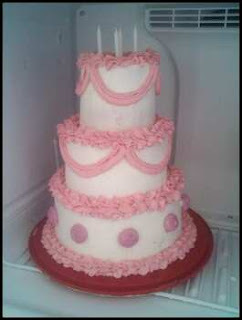 This beautiful cake was Erica J. and London B. 's wedding cake for their June wedding. They wanted a simple cake in lemon and raspberry with buttercream frosting and gum paste flowers. This was my first foray into gum paste (with all those flowers!) and buttercream in the outdoors. 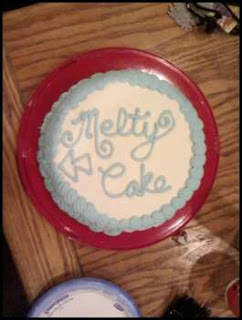 Let me just say, I love fondant. 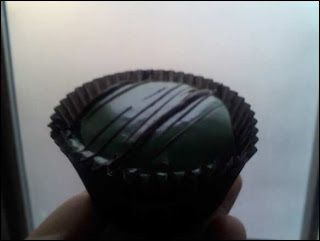 Fondant is strong, it's pretty, and the kind I make is actually tasty. This poor cake began sagging in the heat and required a few extra flowers to balance things out. Too bad, there was some interesting sugar pearl swirls under all those flowers! 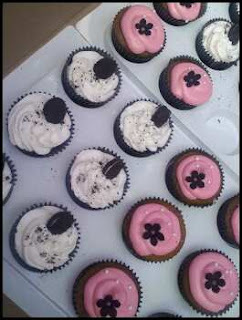 The cupcakes were also lemon and raspberry, with buttercream icing and fondant monograms. A few edible sparkles were added to each cupcake after I heard the groom saying how his new bride made him "sparkle". How adorable! 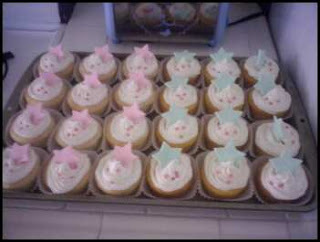 These little babies were half white cake, half lemon, all filled with raspberries and buttercream icing. Plus fondant stars and sugar pearls to continue the design. 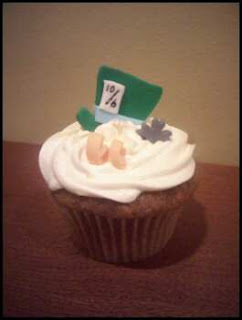 Now that Om Nom Cakes is up and running, I can start showing you some of the Noms themselves. Where better to start than with the very first Om Nom Cake EVER? 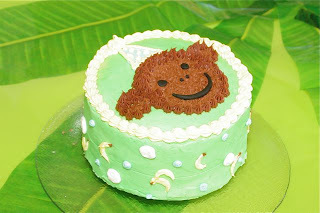 This cake was for a dear friends of mine, Casey P. before he left the US to go to Japan for the holidays. Casey has a bit of a Nintendo fetish, so this replica cake was a good afternoon project for the going away party. Welcome to the future online home of Om Nom Cakes! It might take me awhile to get all of my past cakes on here since HTML is nothing like buttercream, but hopefully with a little help they'll be here for you to see in no time. For now, if you're interested in a price quote for a cake for your event in the Orange County Area, please drop me a line at OmNomCakes@gmail.com!